Took this one evening while exploring the Mission Inn in downtown Riverside. There is a lot to explore here, walking in to the lobby, you would never know that there were many winding, narrow hallways and passages that snake through the complex leading from one interesting room/area to the next. Last fall, on our driving trip from California to Wisconsin, we saw what we thought was a tall, glass” barn” on a hill off the south side of I-80 just west of Omaha, Nebraska. It caught our eye, because Jim (our architect) likes barns and at some point in time talked about how it would be neat to build a glass “cube” type home inside an old barn so you could see the light coming in through the old boards and cracks. When we got home, I tried searching for pictures of it on the internet but couldn’t find any. I thought for sure that if someone built a glass “barn”, that I’d be able to find some kind of reference to it. It turns out that we were making the same drive last week, going to Wisconsin to meet with Jim about our house plans and work on a few other things. As we were driving down I-80, I was determined to be on the lookout for the glass barn so I could take a picture of it for Jim. Funny, because we only drove by it once before, but I could tell when we were getting near and just as it came into view, we pulled over and I took the picture above. I zoomed in to the “barn” with a 300mm telezoom lens and I could see pews as I realized that it was a church of some type. I jumped back in the car to look at the map to see how we could drive over there. We got off the freeway at the next exit and drove down a gravel road past a couple farms to find a sign for the Holy Family Shrine. From the parking area, you could only see the roof of the glass structure, rather there was only a walkway that led to a glass doorway into the side of a hill. The door opened into a cool, cave-like room that had a water feature hanging from a skylight which dripped into a pond/pool in the center of the room. This part of the shrine was supposed to represent Jesus’s burial chamber. From the pool, a small creek ran out towards another doorway outside that lead down a pathway to the glass shrine. Along the walls, there is a great set of storyboard that tells about the planning and construction of the Shrine which you can find here at their website. We walked out this doorway into a beautiful courtyard with colorful trees and flowers with the glass part of the Shrine at then end of the walkway. The construction details were amazing and the site was beautiful. It occupied one of the highest hills in the area so it had a beautiful view of the surrounding landscape. The structure was made mostly of wood and glass with some steel supports that blended in well. The foundation looked to be made of flagstone, which underneath hid the geothermal heating and cooling system. The inside was just as amazing as the outside. Upon entering, the creek-like water feature that ran down the walkway continued inside where it split in two and ran along the bottom of both rows of pews up to the alter where they fell into a large pool. The sound of the trickling water was neat to hear inside the tall glass void. 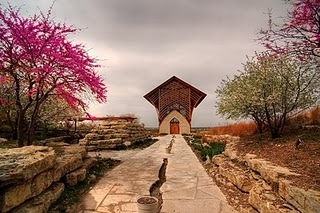 For anyone who might be traveling to or near Omaha, Nebraska, the Holy Family Shrine is definitely worth the detour any time of the year at just 10 miles west, outside the city. I’ll definitely be stopping by again the next time we drive through the area.